More exciting news coming from Detroit. Audi of America has announced the addition of two new engine options for the flagship A8. 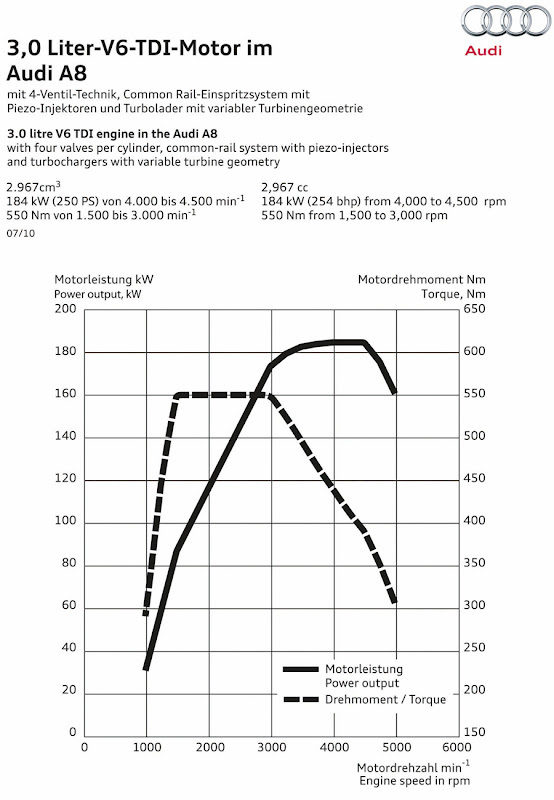 Joining the current 4.2-liter V8 will be a supercharged, 333 hp, 3.0 TFSI V6 (as currently found in the S4) and a 254 hp, 3.0 TDI V6 clean diesel making a massive 405 lb/ft of torque. Though official fuel mileage figures have yet been released, Audi USA notes that both of the new V6 engines will feature stop/start technology and boast "exceptional fuel efficiency in the upper-luxury sedan segment." The new 2013 A8 3.0T is expected to be available in the U.S. later this year. Full report after the jump. Detroit, Mich. January 9th, 2012 - Audi of America today introduced the 2013 Audi A8 3.0T at the Detroit North American International Auto Show. 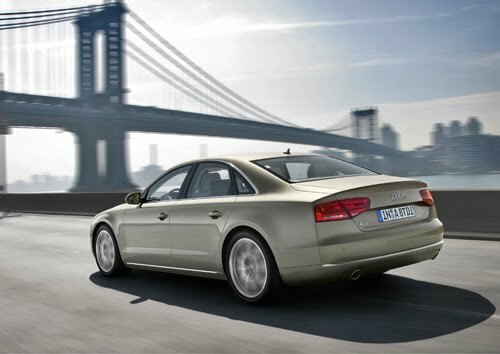 Featuring a supercharged V6 engine, the A8 3.0T delivers 333 horsepower and 325 lb-ft of torque, but with great efficiency. The A8 3.0T will include standard quattro all-wheel drive. Standard and optional equipment availability will be similar to the Audi A8 4.2, including normal and long wheelbase offerings. Later this model year, Audi of America plans to also introduce the 3.0 liter V6 TDI clean diesel in the A8 model line to provide two six cylinder models with exceptional fuel efficiency in the upper-luxury sedan segment. Start/Stop technology will be standard on both models and the first application of this fuel saving technology in the U.S. market for the Audi brand. The flagship of the Audi brand, the A8 impresses with a lightweight aluminum body featuring the Audi Space Frame (ASF), for improved performance, efficiency and ride comfort. Roughly 40 percent lighter than a comparable steel body, the A8 ASF also features high rigidity and excellent vibration suppression to qualify as an exemplary demonstration of Audi ultra lightweight construction. The LED daytime running lights and optional full-LED headlamps serve as an unmistakable design cue while also reducing weight and requiring less energy. Audi connect™ also provides an industry-first factory vehicle integration of Wi-Fi® service. This mobile hot spot capability for passengers allows connections for up to eight Wi-Fi capable devices and permits passengers to connect to the internet, link to email and download music, video or even conduct a video conference. The Google™ Voice Local Search is also a first in Audi connect and it enables more intuitive requests for destinations of interest, while also helping drivers to keep their focus on the road. With the 2012 Audi A8 models, destination searches can be accomplished by voice command, using the innovative Audi MMI touch featuring a touchpad interface or by using the MMI system dial. Other features include, real-time information, such as weather, fuel price updates, and streaming news feeds (available to view when the car is at a stop). Passengers also can enjoy the BOSE® Surround Sound System, or the optional Bang & Olufsen® Advanced Sound System. Audi pre sense or available pre sense plus helps detect imminent collisions and initiates protective measures by tightening safety belts, closing windows and the sunroof and applying additional braking power if needed. Pre-sense plus uses cameras and radar technology to monitor the area surrounding the A8 for any potentially critical situations and helps warn the driver by way of a display in the instrument panel.